Furmanite Australia will highlight its specialist on-site machining expertise on Stand H1084 during AIMEX 2007 – Asia Pacific’s International Mining Exhibition, to be held at Sydney’s Olympic Park from September 4 to 7, 2007. This in-situ machining expertise is put to use in on-site maintenance for shovels, draglines and stacker reclaimers, with capabilities encompassing circular structures up to 30m diameter and bedplates up to 12m2. Other on-site and on-line services; including valve repair, leak sealing, bolting, composite repairs, and pipeline intervention (hot tapping and line stopping); will be showcased on the Furmanite stand. 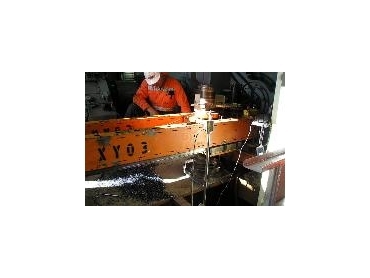 These services are designed to minimise or eliminate plant shutdown. Recently, Furmanite machined all hoist and drag motor gearbox bases and the propel motor bases on a Bucyrus 2570 walking dragline being upgraded at BMA’s Blackwater mine by its maintenance alliance partner Transfield Services. A tolerance of +/- 0.1mm at a surface finish of Ra1.6µ was achieved on the 40 mounting pads, the largest being 7.8m x 1.6m. Two scanning lasers were used to survey all surfaces to be machined prior to machine set up, and to confirm accuracy during the work and after completion. A team of eight Furmanite technicians worked around the clock to complete the work within a 15-day general shutdown.